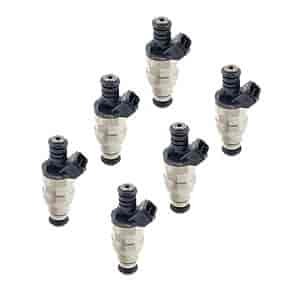 Accel Performance injectors feature all new low-mass disc design that ensures accurate metering control even at ultra-low and high duty cycles. This process ensures accuracy of 1-1.5%. Operates at higher fuel pressures without loss of metering control. Great for blown applications where increased fuel pressure and precise metering are required. State-of-the-art manufacturing processes reduce flow deviations between injectors to improve performance. Low- and High-impedance designs available to match most commercial applications. Provides precise control of fuel delivery and atomization for increased power, improved throttle response and better fuel economy. All-new units! High-impedance fuel injectors are designed to function properly with a vehicle's ECUs. Low-impedance injectors must be used with a programmable aftermarket ECU. Does Accel 150615 fit your vehicle?